Burton Park Wanderers boss Luke Smith has called for his players to help save the club. Chairman Stewart Glendenning last week announced his intention to step down at the end of the season due to work commitments. Wanderers are currently 10 points adrift at the bottom of the UCL Division One and Smith has spelled out the importance of climbing the table. The Latimer Park boss admitted: “If we can’t find a new chairman, that puts Burton Park Wanderers in an impossible position. “It’s not my job to find a new chairman, but if we can put some results together on the pitch, hopefully someone will come forward. “I’ve told the players they are fighting to keep the club going. Smith is convinced he can lift Burton Park off the bottom of the table. He said: “This team is more than capable of getting the points we need. “We have nine games to play – including a match against Bugbrooke – and if players are available and they perform, we can get off the bottom. “If we finish bottom, we have failed, but if we do finish bottom, we will re-apply. Wanderers have taken only six points from 27 games this season, but Smith insists: “We are only a couple of players away from being competitive in this league. “If we had Lewis Marlow in goal every week and someone of the calibre of (Rothwell Corinthians striker) Jordan Henson up front, we would be in a different position. Smith added to his squad last week. 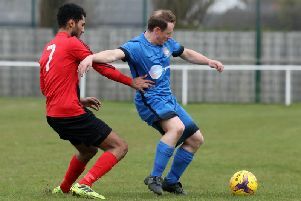 He snapped up former Rothwell Corinthians striker Ian Hay and may add another signing before the trip to Oakham United on Saturday. In his statement announcing his decision to step down, Glendenning said: “I am due to start a new job in April and feel that I must committ to my new job without being distracted by running the football club. “If I could possibly find a way to do both I would. I love everything about this club and I am very upset to have to step down. Stewarts & Lloyds boosted their promotion hopes in Division One with a 4-0 home success over Long Buckby on Tuesday night. Michael Byrne scored twice while Chris Logan and Dan Wilson added the others. The Foundrymen take on Buckingham Town at Occupation Road this weekend while Whitworth have the tough task of entertaining leaders Peterborough Sports. Irchester United will be aiming to end a run of seven successive defeats when they head to Lutterworth Athletic. Thrapston Town, meanwhile, will look to make it 10 games without defeat when they host Long Buckby.